Accueil Produits Bande originale La bande originale de “Ed Wood”. La bande originale de “Ed Wood”. Sortie : 18 octobre 1994. Mr. Lugosi / Hypno Theme – 1:56. Glen Or Glenda – 1:18. Eddie, Help Me – 1:56. Bride Of The Monster – 1:17. I Have No Home – 1:20. Ed & Kathy – 1:28. “Grave Robbers” Begins – 1:16. Ed Takes Control – 4:06. Eddie Takes A Bow – 1:00. This Is The One – 1:58. 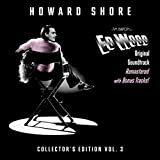 Ed Wood (Video) – 3:22.